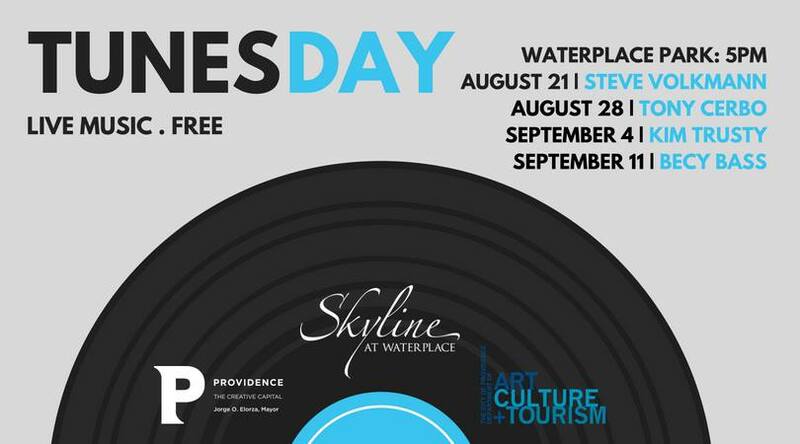 Mayor Jorge Elorza, the Department of Art, Culture + Tourism and Providence Parks are hosting TunesDays, an after-work acoustic series in Waterplace Park. on Tuesdays August 21 & 28 and September 4 & 11. The 4 free concerts start at 5pm on Tuesdays August 21 & 28 and September 4 & 11. The TunesDays series features these local artists set against the backdrop of the beautiful Waterplace Park basin. August 21: singer/songwriter Steve Volkmann, who relocated to Providence and can be heard live at various venues, coffee shops, and festivals. August 28: singer/entertainer/soloist Tony Cerbo, who has performed in venues from New York to Las Vegas, keeping his audiences engaged and energized. September 4: the multifaceted Kim Trusty, who crafts and brands her own style of Jazz, R&B, Blues and original music. September 1: vocalist/steel drummer/actress Becky Bass, a locally renowned vocalist, steel drummer & actor. Find more details about each concert on Facebook!